Uruguay boss Oscar Tabarez said the absence of striker Luis Suarez was not to blame for his side's World Cup exit. James Rodriguez scored twice in Colombia's 2-0 victory to set up a quarter-final tie against Brazil. Asked whether Suarez's four-month ban for biting, and the row that followed, had drained his squad of energy, Tabarez said that was not the case. "When he was no longer with us, that was the end of that," said Tabarez. "We accepted he was suspended." In fact, Tabarez said his team were determined to beat Colombia following the "excessive harshness" of the punishment meted out to Suarez. "I think that generated a lot of strength and willingness to get a result," he said. 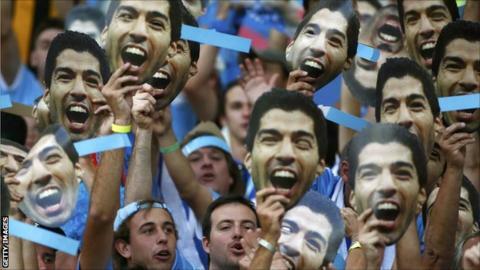 "Suarez is very important to us. I don't have to say that, but we knew that he was not going to play." Liverpool striker Suarez was banned after biting Italy defender Giorgio Chiellini during Uruguay's 1-0 win in the group stage. The suspension means the 27-year-old is banned from all football-related activity, including training with Liverpool and entering the confines of any stadium. "It's a breach of human rights that a player cannot go into a stadium where there are 80,000 people, or into a hotel with his team-mates, that he cannot work for four months," said Uruguay captain Diego Lugano. "He has committed a crime, but this ban is barbarity. Not even a criminal would receive this penalty." While Tabarez played down the impact of losing Suarez, Lugano believes it had a major impact. "He is irreplaceable," added Lugano, who initially tried to play down Suarez's bite on Chiellini. "For years he has been our best player. Us losing him is much worse even than Brazil losing Neymar or Argentina losing Lionel Messi."